"This picture was taken on 16mm Plus X film with a Mamiya 16 Automatic. I had just loaded a cassette the evening before, and was running the first exposures through the camera in about 35 years. I say 35 years, because when I received the camera from my uncle, the partially exposed Tri-X cassette inside had an expiration date of 2/62. 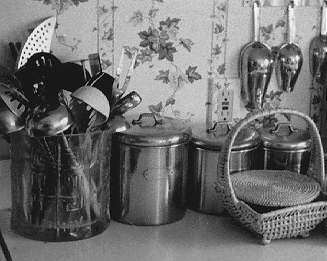 Having breakfast early the next morning, a Saturday, I saw the sun streaming through the window and fall on this still life of kitchen utensils. Exposure was with the built in meter, f5.6 at 1/50. Development and printing data: Rodinal 1 to 50 dilution, printed on Ilford Multigrade III paper, pearl finish, with a Leica Focomat IIC enlarger, 50mm Elmar lens, f/8. Initial scanned print 4" x 5"."